Alice Luňáková, from Masaryk University in Brno, Czech Republic, presented a joint Keston Center and Texas Collection lecture on Tuesday, August 30, 2016, entitled, "How Kolaches Came to Texas: A Social and Cultural History of Czech Migration." The lecture took place at 3:30 p.m. in The Texas Collection, located on the first floor of Carroll Library on the Baylor campus. A reception followed. As an exchange student at McLennan Community College in 2014, Alice learned of the rich Czech heritage and history that lies in central Texas. 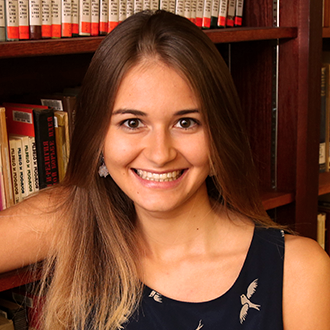 Alice was drawn back to Waco in 2015 to spend time researching Czech history, and began work on an academic thesis on Czech immigration to Texas. While in Waco during 2015, Alice spent her time in Baylor’s Keston Center and Texas Collection doing research. "I was helping to classify and translate the Czech materials like articles in the newspapers," she says, elaborating on her duties at the Keston Center. "These articles come mainly from the communist period, which was 1948-1989. I was researching the materials regarding the Czech immigration to Texas in the nineteenth century and I found many useful and interesting books." The topic of Alice’s lecture will discuss her findings. "My lecture will be connected to my thesis – the Czech immigration to Texas in the Nineteenth Century," Alice explains. "I will talk about the reasons the Czechs decided to leave their homelands and I will describe the struggles they had at their beginnings." In the future, Alice aspires to work in diplomacy to help keep the strength of the Czech-American relationships. Her studies and work in both America and the Czech Republic will prepare her for this future.